For the 2006 Lincoln Zephyr, see Lincoln MKZ. Not to be confused with Ford Zephyr or Mercury Zephyr. The Lincoln-Zephyr was the lower-priced line of mid-size Lincoln luxury cars from 1936 until 1940. The Lincoln-Zephyr and Mercury, introduced in 1939, bridged the wide gap between Ford's V-8 De Luxe line and the exclusive Lincoln K-series cars. This served a purpose similar to Cadillac's smaller LaSalle "companion car", the Chrysler Airstream, and Packard's entry level Packard One-Twenty. The car was conceived by Edsel Ford and designed by Eugene Turenne Gregorie. The Zephyr's V-12 engine was unique in its class, with the LaSalle having a V8 and the Chrysler and Packard straight 8s. Introduced on November 2, 1935, as a 1936 model, the Lincoln-Zephyr was extremely modern with a low raked windscreen, integrated fenders, and streamlined aerodynamic design, which influenced the name "zephyr", derived from the Greek word zephyrus, or the god of the west wind. It was one of the first successful streamlined cars after the Chrysler Airflow's market resistance. In fact, the Lincoln-Zephyr actually had a lower coefficient of drag than the Airflow, due in part to the prow-like front grille on the Zephyr, reflecting the popularity of leisure speedboats like Chris-Craft. The Lincoln-Zephyr succeeded in reigniting sales at Lincoln dealerships in the late 1930s, and from 1941 model year, all Lincolns were Zephyr-based and the Lincoln-Zephyr marque was phased out. Annual production for any year model was not large, but accounted for a large portion of the Lincoln brand's sales. In its first year, 15,000 were sold, accounting for 80% of Lincoln's total sales. The idea of a smaller and more modern luxury car to fill the gap in Lincoln's traditional lineup was revisited in the 1950 Lincoln Lido (The Lido was the same size as other two-door Lincolns, though), 1977 Lincoln Versailles, 1982 Continental, and 2000 Lincoln LS. The Zephyr name was resurrected in 2006 for the car's spiritual successor, the Zephyr, which was quickly renamed the MKZ for 2007. When Lincoln resumed production after World War II the Zephyr name was dropped and the cars sold without a proper model name, known just by their body styles - Sedan, Club Coupe, or Convertible Coupe - during the 1946-1948 model years. For identification purposes, they are typically referred to as the H-Series, while the approach of offering a luxuriously equipped vehicle in a smaller size was ceded to the all-new Mercury in 1938. The Zephyr was designed by John Tjaarda (1897–1962), who was fascinated with airplanes, resulting in unibody construction relatively light and rigid for its size and a drag coefficient of 0.45. Weight was 3,350 lb (1,520 kg). 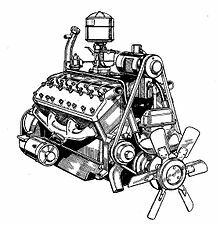 The original engine had 110 hp (82 kW) and gave the car a top speed of 90 miles per hour (140 km/h). Suspension was Henry Ford-era transverse springs front and rear, with dead axle front and torque tube rear, already quite outdated when the car was introduced. Brakes were cable-activated for 1936 to 1938; 1939 and onwards were hydraulic. The Zephyr was the first Ford product to have an all-steel roof, except the late 1931 Model AA truck. ^ "Directory Index: Lincoln/1936_Lincoln/1936_Lincoln_Zephyr_Folder". Oldcarbrochures.com. Retrieved 2011-12-31. ^ a b c d e f Kimes, Beverly (1996). standard catalog of American Cars 1805-1942. Krause publications. ISBN 0-87341-428-4. ^ "Directory Index: Lincoln/1940_Lincoln/1940_Lincoln_Zephyr_Brochure_1". Oldcarbrochures.com. Retrieved 2011-12-31. ^ Dammann, George H.; Wagner James K. (1987). The Cars of Lincoln-Mercury. Crestline Publishing Co. pp. 203–204. ISBN 0-912612-26-6. ^ "Directory Index: Lincoln/1941_Lincoln/1941_Lincoln_Zephyr_Brochure". Oldcarbrochures.com. Retrieved 2011-12-31. ^ Dammann, George H.; Wagner James K. (1987). The Cars of Lincoln-Mercury. Crestline Publishing Co. p. 199. ISBN 0-912612-26-6. ^ Dammann, George H.; Wagner James K. (1987). The Cars of Lincoln-Mercury. Crestline Publishing Co. pp. 223–224. ISBN 0-912612-26-6. Bonsall, Thomas. The Lincoln motorcar, Sixty Years of Excellence. Dammann, George H.; Wagner, James K. (1987). The Cars of Lincoln-Mercury. Crestline Publishings. ISBN 0-912612-26-6. Wikimedia Commons has media related to Lincoln Zephyr. The Old Cars Manual Project Original Lincoln and Lincoln-Zephyr sales material for comparison. This page was last edited on 6 February 2019, at 21:43 (UTC).